Get the Hopper – Smart HD DVR from DISH and record your favorite shows, use your favorite apps like Netflix, YouTube and Pandora. With the Hopper 3 you can skip commercials with AutoHop and watch TV anywhere with DISH Anywhere. Compare qualifying dish TV packages. With these easy-to-use features and cutting edge technology, the Hopper Smart HD DVR is the best DVR in the business. Available for an additional $5/mo on most qualifying packages. ¹- More than 6 TVs requires customization. ²- When a Joey receiver is not using the second tuner. ³- With Hopper Duo, you can use DISH Anywhere but there is no “Live TV from the box streaming”. * Search includes channel line-up, DVR, On Demand, and Netflix results if applicable. ** Requires OTA adapter. The Hopper 3 Smart Whole-Home DVR from DISH is the only DVR that gives you the power to automatically skip commercials in recorded prime-time television. By enabling the exclusive “Auto-Hop” feature, commercials disappear with the push of a button — giving you more time to catch up on your favorite shows. The Hopper 3 is available on most qualifying DISH packages for and additional $5/mo. The Hopper 3 Smart Whole-Home HD DVR from DISH, is the most powerful DVR on the planet. Watch and record up to 16 programs at once, take advantage of it’s 4k ultra HD resolution, or play four channels at once on a single screen. A new user interface, powered by an extremely fast quad-core processor, delivers the best experience available. You can upgrade to the Hopper 3 for only $5/mo more on most qualifying DISH TV packages. Your favorite shows shouldn’t be confined to a single room. The Hopper can be paired with a Joey to give you complete DVR access from any room in your house. Save shows, browse apps, watch recorded programs — with the Hopper, DISH gives you complete control from any television. The Hopper 3 is integrates with apps, such as Netflix, YouTube, Pandora, VEVO and more, so you can easily watch or stream from services outside of DISH’s stellar channel lineup. A new user interface, powered by an extremely fast quad-core processor, delivers the best experience available. Dish TV service with the game changing Hopper 3 create an unrivaled viewer experience. Turn your smartphone or tablet into your mobile TV! With the Hopper 3, DISH lets you watch live TV plus your recorded shows directly from your iOS or Android device — all you need is an Internet connection and your entertainment goes anywhere you do. How many shows can the Hopper 3 record at once? 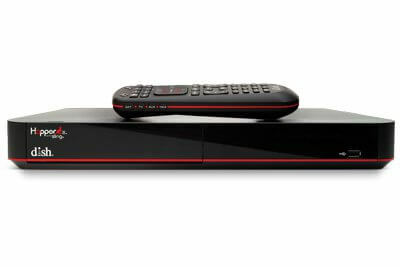 The Hopper 3 Smart Whole-Home HD DVR from DISH lets you watch or record up to 16 different channels at once. That's twice as many as ant other DVR on the market. A Joey is a receiver for the Hopper. The Joey lets you access anything that you have recorded on your Hopper, from anywhere in your home. How much storage does the Hopper have? The Hopper 3 can store 2 terabytes of information which is about 500 hours of HD programming. The Hopper 3 includes a USB port which lets you connect an external hard drive to your Hopper for more storage.